Hey, parentals! That glorious event we've been eagerly awaiting all summer is almost upon us. That's right, I mean back-to-school time! (Holding for applause.) This week, Craft Apparent celebrates with a project that assures that this year, our kids' lunch is in the bag! So, ditch your disposable. 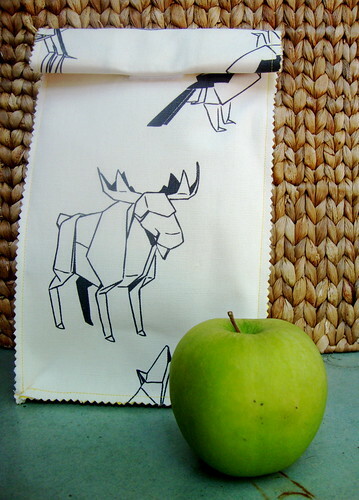 A litter-free snack sack is simple to sew and easy on the Earth. Here's how you can make yours! Cut: two, 14" x 7" (sack front & back), one, 4 1/2" x 7" (bottom), and four, 2 1/2" x 14" (sides) pieces of main fabric. 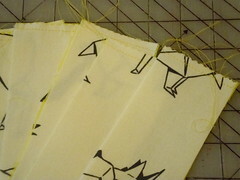 Repeat for lining and iron-on adhesive. Following the manufacturer's instructions, iron on adhesive to the wrong side of all main pieces of fabric. Iron lining pieces to adhesive on the main pieces. Using a 1/4" seam allowance, top stitch across the top edges of the side, front & back pieces. With right-sides together and using 1/4" seam allowance, sew two of the side pieces together to create a wider side. Press seam. Repeat for remaining, two side piece. Assemble the rest of the sack by sewing front, sides, back and bottom pieces together with wrong-sides facing and using a 1/4" seam allowance. Trim edges. 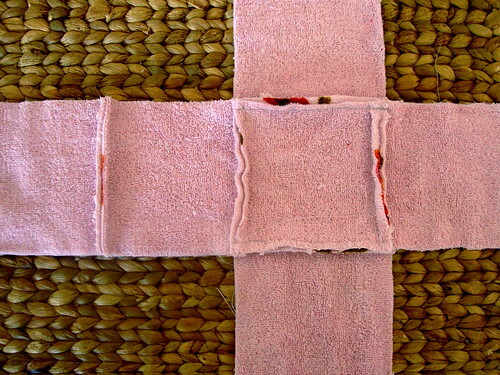 Measure 3 1/2" down from top edge, of the front of sack; center and sew or stick-on piece of Velcro. Sew or stick on reciprocal piece, 1/4" from the top edge of the back of sack. TIP: Spray sack with fabric protector before use to guard from excessive food stains! I'm a sucker for a vintage towel. I buy them up at the thrift store whenever I find a batch from the 60's or 70's that through the decades, in a feat that can only be credited to science, seem to have retained all of their color glory. I find their cheery powder-roomness quaint and their size, adorable--I mean really, how did grown-people wrap themselves in these things?! In the past, I've used these towelettes as re-usable wrapping paper, cut them up and knit them into bath rugs and turned them into swimsuit cover-ups. 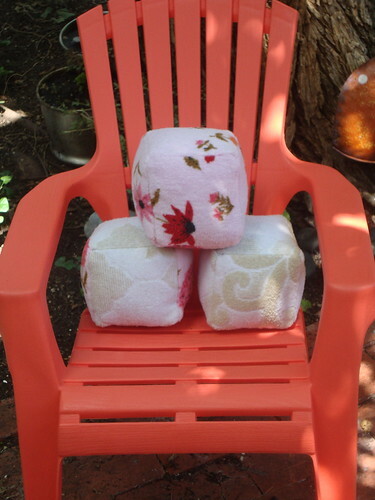 Today however, I'm turning terry cloth into toys by making these cutie cubes for a little beach blanket blocko! They're great for baby to play with at the pool or snuggle with in the sand. Join me in a little cuddly kitsch, won't you? Here's how! Cut out six, 5" pieces of towel. 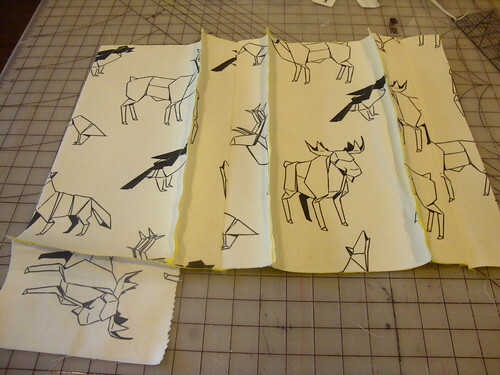 You may find it helpful to first create a paper template to pin on the fabric before cutting. Your choice. 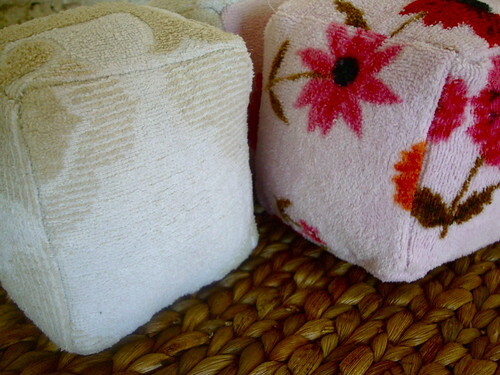 Fold and sew piece into a cube shape, leaving one side open. 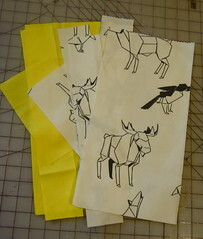 When sewing is complete, it will look like the picture below. Turn piece right-side out. Generously stuff with polyester or bamboo stuffing. If you're feeling fancy, you can substitute 5" pieces of foam for the stuffing. I was not, in fact, feeling fancy. Fold the edges of the open side under and pin together. Hand sew closed. Make as many as you feel like toting to your next trip to the beach for your family's very own block party! Har, har, har. It's true, crafts are often a great diversion for kids while us parents are working on something else. Sometimes though, a project that rallies the whole family for a little quality time, is just what the crafty doctor ordered! Enter, the I Spy A..., photo softie book--a journal of pictures taken by you and yours, of themed items from your own town. Now, depending on how adventurous you are, you either load everyone up in the car and start driving aimlessly or, do a few internet searches for businesses and streets with names that match the words on your list first. Either way, don't forget to bring your digital camera with you when you go! Encourage your kids to get their spy eyes on and point out any items they see that might fit the bill. Whenever you spot something, safely pull over the car and snap the shot. If you have older kids, let them handle photography duties--it'll nurture their appreciation for details! Once you have at least 6 photos taken, head on home and get them printed out. Then, you'll be ready to start book making. 6, 4"x6" Ireland-related photos taken of signs and monuments around your town. Cut four, 7"x14" pieces of gold felt (these will be the pages) and six, 4 1/2" x 6 1/4" pieces of white felt (these will be photo mats). 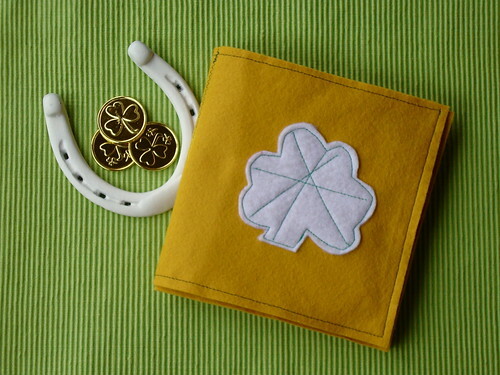 Cut a Shamrock out of remaining white felt, using a template or cookie cutter as your guide. Sew a photo mat with photo on top each, on both the right and left sides of three of the gold pieces. Avoid using pins to keep the photos in place while you sew, as you don't want to create extra punctures in the photos--instead, just hold them in place as you go. 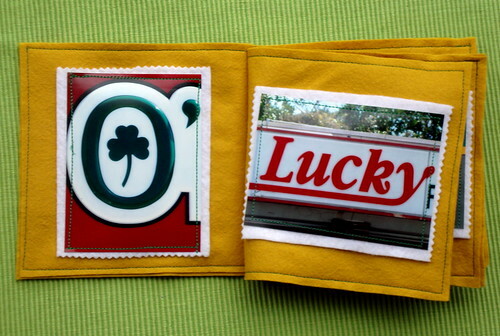 Sew Shamrock on the right side of the fourth, gold piece (this one will be your front and back cover). With wrong sides facing and using a 1/4" seam allowance, sew two of the gold pieces together. Repeat for the remaining two pieces. Layer pieces so the the cover piece is face down with the other on top of it. Using a zig-zag stitch, sew down the center of the pieces to "bind" your photo book. Ditch the felt & thread for paper & glue; make a photo scrapbook! Use your finished book as an opportunity to chat with your children about the experience and about other, cool things they noticed around the city while you were on your drive together. Wishing you the luck of the Irish in all of your crafting! P.S. 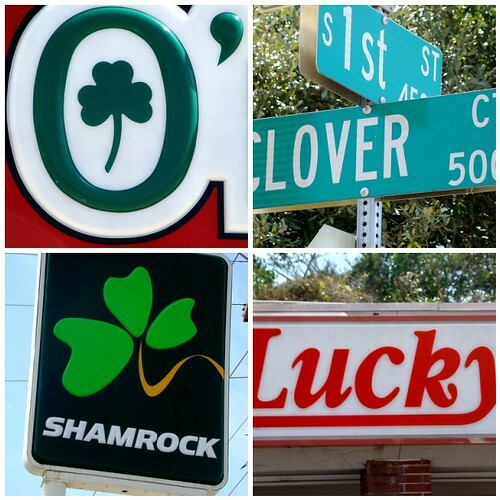 Sign & monument photos also make great greeting cards--simply glue one onto the front of plain card stock! 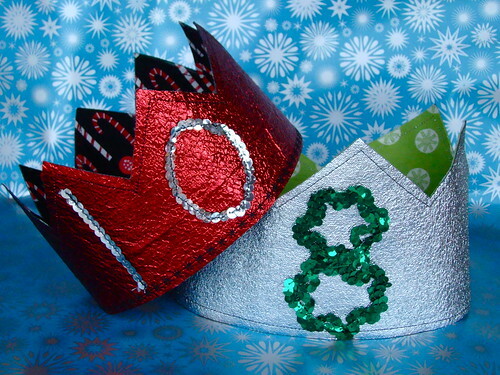 Make this year extra-special by creating a customized crown for your birthday boy or girl! 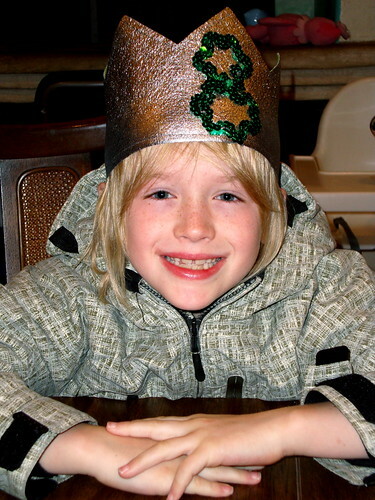 Metallic fabric & sequin highlight the royal awesomeness of kiddo's big day, while a contrasting cloth lining personalizes the piece with his or her favorite color or theme--my sons both chose linings to reflect their winter birthdays! With either sew or no-sew options this project is easily make-able, no matter your crafty level of expertise. 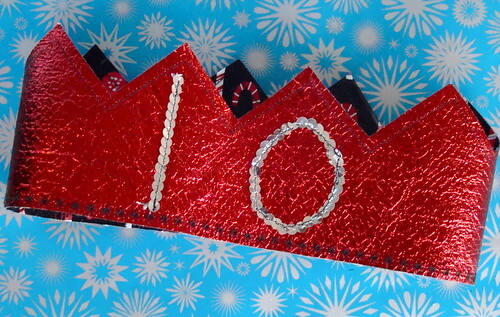 Put one together every year as a keepsake or simply, replace the sequin number as your child gets older. Either way you'll have a reusable treasure that can be broken out for special occasions, or kept in the costume box for year 'round razzle-dazzle! Loosely measure child's head, allowing room for hair not to be too smooshed. Add 1/4" to that measurement giving you your length,number, "L" . Cut 4"x L" pieces of metallic fabric, lining fabric and iron-on adhesive. Sandwich the iron-on adhesive piece in between the pieces of fabric (with right-sides of fabric facing out). Following the adhesive's manufacturing instructions, iron the three pieces together. Using a straight edge and pencil draw a zig-zag, evenly across the top of the lining side of the piece. Cut along lines, creating crown points. 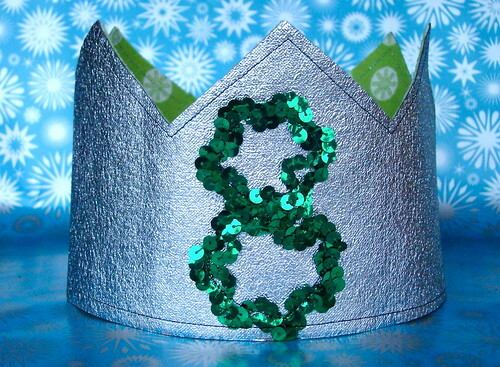 Layout sequin trimming (pinning if necessary) in shape of desired number, on the center-front of crown. Either machine sew or hot glue in place. With wrong sides facing and using a 1/4" seam allowance, sew or hot glue crown ends together. Turn right side out. If you choose the sewn option, top stitch over seam. Hey, happy birthday to those beautiful, Craft Apparent kids! Psst! Make this craft? We'd love to see a picture of it...and we're sure others would too! Join the Craft Apparent Flickr group and upload photos of you're awesome Craft Apparent Crafts! 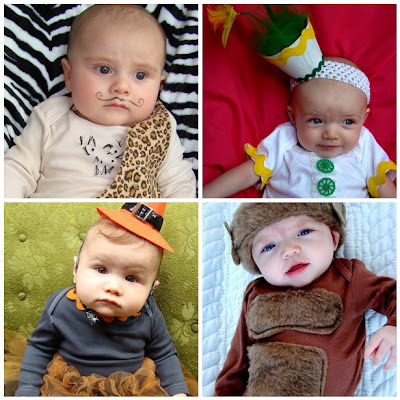 Hey there and welcome to the very first article on the PBS Parents' CRAFT APPARENT blog! I'm Vickie Howell, and I'll be your guide to all things craft-- with and for your kiddos. As the mother of 7 & 9 year old boys and a 4-month-old girl, I'm inspired on a daily basis by my children. They're often my creative muses as well as both recipients and collaborators on projects I make. Like most parents though, I struggle to juggle family with life's other obligations. There's not a lot of time and in this economy especially, not a lot of extra money--if we're going to nourish our creative sides, then it needs to fit into both our schedules and our budgets. CRAFT APPARENT is right there with you; focusing on get-crafty projects for you and your kids that only require a little bit of time and cash! 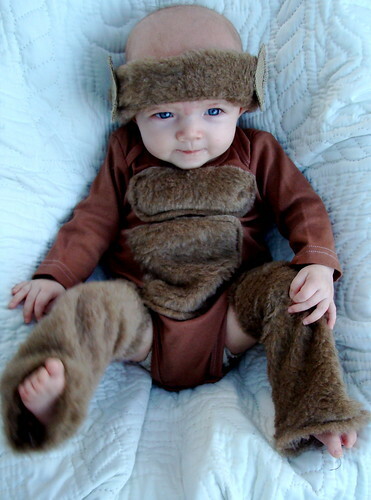 Today I'm showing how to create unique and adorable costumes for your little goblin; all beginning with a plain, white snap suit (ya know, those one-piece rompers that have a name that's trademarked ;-)). They're easy to assemble (with both sew & no-sew options), can be made in a few hours, and all cost under $20. Hooray for Halloween! Naturally dye snap suit by simmering on the stove top, in a large pot filled with 8-10 cups of already made coffee. The longer you let it soak, the darker the snap suit's "skin tone" will be. Rinse thoroughly; let dry. To make leopard front, lay a small piece of fabric over snap suit. 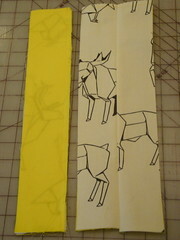 Using a marker, trace the outline of an over-the-shoulder-type loin cloth on top of fabric (Doesn't need to be perfect! ); add 1/4" around. Cut out. Fold over rough edges 1/4" & press with iron to create hem. Glue or sew hems. Machine, hand-sew or glue leopard piece to snap suit at the crotch, sides and shoulder. Make sure to leave a little bit of give room for baby belly! 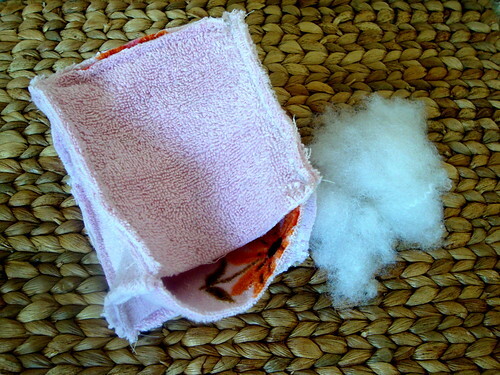 To make chest sprouts, use needle to pull knotted pieces of embroidery thread through from the underside of snap suit. Snip pieces to about 1". Rub between fingers to fray. To make mini-barbell, braid 3, 10" bunches of yarn; knot at both ends. Cut out 4, small circles (juice glasses make a great template) of black felt. Sandwich yarn between 2 felt circles and glue or sew together. Repeat on opposite end. To make skirt, measure around baby's waist to give you measurement "x". Multiply "x" by 2. That number will give you the pre-gathered, skirt width "y". Cut "y" x 9"(length) piece of solid color fabric. 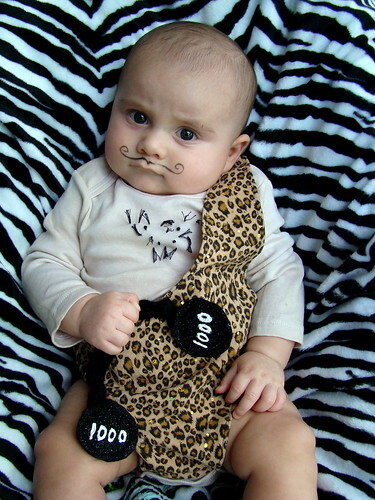 Note: Add 1"-2" in length for older babies. Cut 7"x 9" (or whatever the length of other piece is) piece of contrasting fabric. Hem sides and bottoms of both pieces by pressing 1/2" and sewing, gluing or using fusible tape to secure. Center contrasting piece on solid fabric; fold top edge of both pieces over 1 1/2" and sew or glue or fuse (using 1 1/4" seam allowance) to secure. This will create a ribbon channel. Use safety pin to feed ribbon through channel. Gather skirt, tie a bow and trim ribbon. 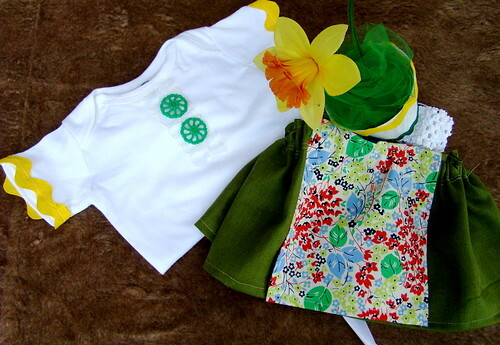 Decorate snap suit by attaching decorative RicRac & ruffle to collar & sleeves. Hand-sew buttons to bodice. Important: Do not glue--buttons are a choking hazard if not secure! To make flower pot head piece, paint plastic cup. Let dry. Embellish with Ric-Rac at top and bottom of cup. Cover inside bottom of cup with liberal amount of hot glue. Place flower in center; stuff in tulle. Hot glue flower pot to headband. Dye snap suit in washing machine, using black fabric dye and following manufacturer's instructions. Wash & let dry. 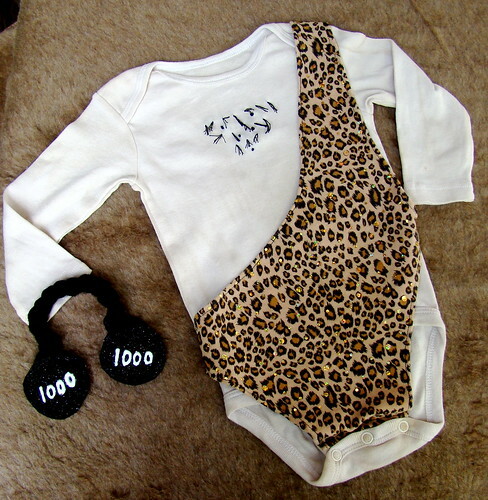 Embellish onsie by sewing or gluing RicRa to collar. Hand-sew spider to sollar. Important: Do not glue--plastic spiders are a choking hazard if not secure! 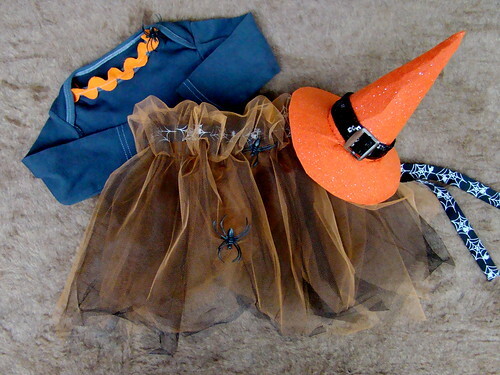 To make skirt, hold black & orange 1/4" yard tulle pieces together; fold in half length-wise. Use a needle and thread to make a running stitch about 2" from fold. Pull on thread ends to gather. Use safety pin to feed 1 piece of ribbon through channel. Gather skirt, tie a bow and trim ribbon. Hand sew plastic spiders to skirt front. Cut up skirt bottom to desired length--the more jagged the spookier! To make hat, use a dinner plate to trace a semi-circle onto orange felt. Cut out semi-circle, then cut it in half--you'll use just one of those pieces. Roll 1/4 circle piece into a cone. Hand sew or glue seam. Trace around the circumference of the cone opening onto the 2nd piece of felt. Center salad place over the circle you've just drawn and trace a larger circle around it. Cut out both outer & inner circles to create brim. With right sides facing, stick cone inside inner circle; glue or hand sew into place. Glue buckle adornment onto hat, above brim. Cut piece of ribbon in half; hand sew pieces evenly, to underside of brim. Dye snap suit in washing machine, using brown fabric dye and following manufacturer's instructions. Wash & let dry. 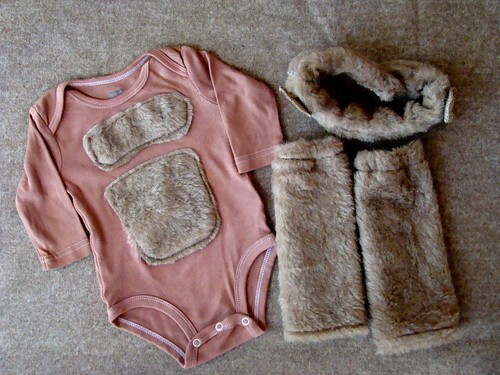 Use a marker to draw chest & belly shapes on the back of faux fur. Cut out. Glue or sew to snap suit front. To make legs, measure around the chunkiest part of baby's thigh; add 2" to that measurement. Measure length from thigh to heel. Using those measurements, cut out 2 rectangle pieces of faux fur. Cut 1/4" wide elastic pieces to baby's thigh measurement (without adding extra 2"). Hem the top and bottom ends of one rectangle by folding raw edges over 1/2" and machine or hand sewing. Use safety pin to feed elastic through top hem of piece. With right sides facing, fold faux fur in half width-wise. Machine or hand-sew up the back. Turn right side out. Repeat for other leg. 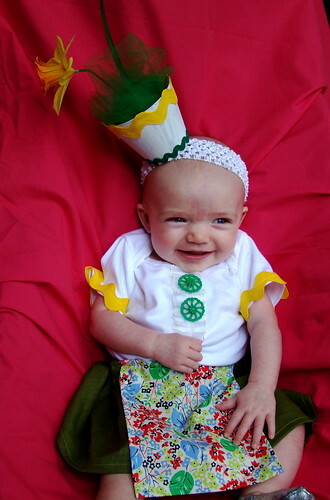 To make headband, measure baby's head; add 2" to that measurement giving you measurement "x". Cut out faux fur strip that measures 2" by "x". With right sides facing, fold strip in half width wise. Seam up; turn right side out. Cut piece of elastic to baby's head measurement (without adding extra 2"). Feed elastic through headband; fold in half and sew ends together to form a circle.